. استمتع بالخدمات الراقية والضيافة التي لا مثيل لها بهذا الفندق في غرامبيانز. هذه بعض الخدمات الموجودة في هذا الفندق: واي فاي مجاني في جميع الغرف, مجهز لذوي الإحتياجات الخاصة, تسجيل وصول/خروج سريع, واي فاي في المناطق العامة, صف السيارات. يمكن للنزلاء الاختيار من ضمن مجموعة من الغرف المصممة بعناية لتعكس جواً من الراحة، والتي يتجاوز عددها 6. يمكنك الاستمتاع بالأجواء المريحة التي تقدمها حديقة طوال النهار. مهما كانت دواعي سفرك فإن Halls Gap Valley Lodges هو خيار ممتاز لإقامتك في غرامبيانز. We have 7 adults and 3 children for this trip. The lodge was above our expectation, clean, neat and fully equipped. Although its abit off the town but we enjoy the peaceful, quiet and cosy place. lots of aminals around like Kangaroos, Emus, rabbits etc... we love it. The best lodging in the Grampians, owners were super friendly and the rooms were huge. Perfectly suited for what we needed. We did not eat there, but the room had an excellent kitchen. The wildlife was just outside our window. Emu, kangaroo, cockatoo, Eagles and of course rabbits!! Very close to walking/biking trail and handy to town and of course the Grampiains N. P. Owner seemed to be in a hurry when we checked?? Thuis is our 3rd time staying at this motel. Except for a faulty water tap, which was fixed immediately, everything else is what we expected. Would stay here again for ou next visit. Units are spacious with a well equipped kitchen. Wildlife. The views. Very peaceful. The wildlife was wonderful. Units are very clean,spacious and well equipped; comfortable couches. Being set back from the road is an advantage.Great having a washing machine but in winter not having a dryer would be a disadvantage. View from the unit is spectacular. Fans only in the bedrooms. It was hot when we stayed and the bedrooms, especially the 2nd bedroom were hot. Air conditioning in the lounge kept the master bedroom cooler if the doors were open. Perfect getaway location, had a lovely time at halls gap valley lodges. Highly recommended, will definitely come back. Very Clean, Quiet, has everything you need, lots of wild life, and offers good value for money. This is our second stay at this motel. Spacious, confortable beds, quiet and lots of wild life near by. Although it's a few Km away from town centre, but not a problem for us. Owners are very friendly and helpful in giving advise. Will defintely stay here again for our next trip to the Grampiants. Good quality facilities provided. Good access to both nearest centre and also sightseeing areas. Quiet and restful surroundings. We were very impressed with the lodges. Everything needed for self catering was provided and there was also good internet access. The local wildlife was literally outside your door with cockatoos, kangaroos, emus and deer evident in large numbers. There were extensive grounds to walk in with great views all around. Very cozy, quiet and earthy surroundings made it peaceful especially with the wildlife nearby. The heater was small to warm all rooms, you need to leave the bedroom doors ajar for the heat to circulate. But a good stay had. Cleanliness, tranquality, fabulous surrounding nature. Relaxing stay. Good kitchen. Nice mountain view. No traffic noise. Free Wifi available. Spacious, Clean, nice layout. SPA is great. Quiet and lots of wild life near by. We were greeted warmly during check in, and was even offered choice of unit types , and we took unit #6 (one queen bed and 2 singles). The units all look quite new and well maintain, good size, nice layout, the kitchen has everything we needed. Lots of windows so we get to see very good view of grampians from our unit. The SPA is great for relaxing after a days hike in the grampians. Our kids love the walk to the open field at the evening to look for wild life. We saw kangaroos, rabbits, dears and even the fox running across the field, and at the back of the motel. Star glazing is another wonderful experience, and we saw a shooting star on our second night. Would be perfect if the unit has a dryer, so we don't have to dry our clothes outside. 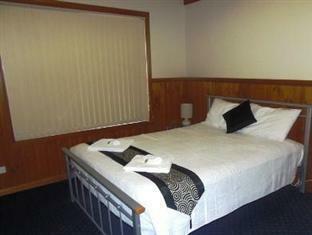 Overall, we are very happy and satisfied with the stay, and the motel staff is friendly and helpful. Will stay here again during our next visit to Grampians. The lovely owners, the cottage itself and how lovely it was and the views from outside of our house. It was great I can't wait to go back!!! The room was clean and tidy and was close to dining and local shops. Loved the big spa bath the best! !